Many HR experts will say they are concerned about that whooshing sound – i.e. the sound of their top talent sprinting out the door. Adding to that stress, the baby boomers who are estimated to be retiring at a rate of 10,000 per day. The millennials currently make up the largest part of the working-age population, yet don’t possess the desired skill sets to lead major corporations at the highest levels. That leaves Gen X smack in the middle, but they are the whooshing sound. Here’s the irony of the situation. Even though companies are facing this talent crunch, black women are consistently overlooked for advancement and development opportunities in the workplace. 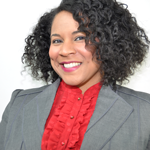 This may be a driving force behind the meteoric rise of black women owned businesses. This is like buying stock, watching the price go up but never selling to realize the gain on an investment. Corporate America is not realizing the talent ROI on their investments, so black women may be capitalizing on the paid training they received and turning their talents into multi-million dollar businesses. 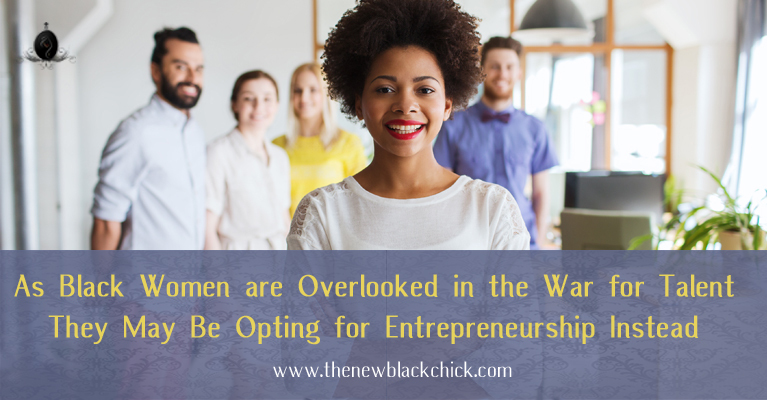 According to the 2015 State of Women-Owned Businesses Report commissioned by American Express Open businesses owned by black women has grown 337% since 1997. It’s estimated that black women are at the helm of roughly 1.3 million businesses or 14% of all women-owned businesses. 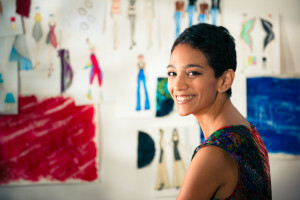 These are successful businesses employing nearly 300,000 people and generating an estimated $53 billion in revenue, while businesses owned by men have declined on both fronts. Further, black women own almost half of all black-owned businesses, employ 29% of the workers, and account for 29% of revenue earned. While this is great news, is the catalyst for this growth the increasing frustration with Corporate America overlooking black women as top talent? Will Black women be the next mass exodus behind baby boomers and disgruntled Gen X’ers? And given the fight for talent, can Corporate America afford to let another group whoosh out the door or should they lean in? Black women have made some professional strides but still significantly lag white women in career progression. We hear a lot about women hitting the glass ceiling, but it seems as if black women aren’t even in the vicinity of the glass ceiling let alone hitting it. Currently there is only one black woman to hold the post of CEO of a S&P 500 company out of 23 women. The Center for Talent Innovation, CTI, released a study, Women Want Five Things, in 2014 to understand women’s ambitions. They collected responses from 356 black women and 788 white women. 44% of the black women reported feeling stalled in their careers compared to 30% for white women; 26% of black women felt their talents weren’t being recognized by their managers versus 17% of white women. All of this during a war to hire and retain the best and brightest. This begs the question, when you have a solid employee (regardless of gender or race) that wants to be developed what sense does it make to overlook them and let (or push) them out the door? Let’s explore why, during a war for skilled talent, black women are overlooked. 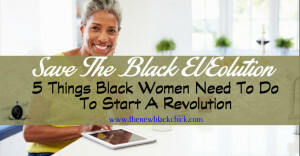 Are Black women less ambitious? Not according to CTI’s study. They found that black women are outliers when it comes to their desire for leadership and power. Black women are 2.8 times more likely than white women to aspire to positions of power. Not only that, when they do achieve positions of leadership they are expected to act the part. A study published in Psychological Science reveals that black women aren’t seen as a cross-pollination of black men and white women rather they are seen as similar to white males. The expectation, then, is that black women will be as assertive (not aggressive) as their white male counterparts. Where have I heard that before? Oh, I’ve said it, now my theory has some backing. This expectation, however, only applies if you have achieved the leadership level. Black women who demonstrate this trait at lower levels are more likely to be demonized for displaying the same leadership attributes as their white and black male counterparts. With 22% of the black women saying they want a position of leadership and prestigious title versus 8% for white women, a lack of ambition doesn’t seem to be the issue. Are Black women less educated? Perhaps the competition is tight. Black women must be competing with talent that attained higher levels of education. Yes, the competition is tight, but it’s to catch up with black women. Black women are the most educated demographic in the US. 9.7% of black women are enrolled in either a two or four year college program or graduate school. The national average is 6.9%. The percentage of white men and women enrolled in the same programs are 6.1% and 7.2% respectively. This is according to the US Census report on school enrollment published in 2013. Perhaps it’s a matter of pedigree, so to speak. In 2011 the average enrollment of blacks at Ivy League schools was about 7%. Of those that attend Ivy League schools they tend to graduate at roughly the same rate as their white counterparts with one or two schools as standouts, where blacks drop out at higher rates. Many black women are opting for HBCUs (Historically Black Colleges and Universities) depending on their level of preparation in high school, where they feel most accepted and confident their specific education needs will be met. Given that black women make up 7% up the US population and account for 9% of the total population enrolled in school, it’s probably a safe bet education isn’t the issue. Are Black women not as skilled? Okay, so black women may be ambitious and may be educated but are they skilled? Once in a role a person is taught what they need to know. If you’re not skilled at your job, you’re likely to get fired regardless. Getting the best promotions may come down to skill between two top candidates. Making it to the short list in the first place is the real skill. Why aren’t black women making it to the short list? White males often have the advantage of other white males putting them on the short list or they are sponsored by a top level executive. This is, in part, human biology. People naturally gravitate toward people with which they share commonalities. Then it should be okay when people of color look to bring up other people of color or women look to bring up women, right? Wrong. In 2014 David R. Hekman of the University of Colorado and Maw Der Foo and Wei Yang of the University of Colorado, Boulder, set out to answer an interesting question – if white males are outnumbered by women and minorities why are they still in control of all large US organizations? They conducted an experiment and found that when women or minorities advocated for women or minority candidates that they were seen less favorably in the instance where diversity was not valued highly. Even other women and non-whites rated the candidates lower. One of their high level conclusions is that white males may be the key to creating more diversity because who they want to get the job is who gets the job. It found that men are hired or promoted based on their potential while women must demonstrate worthiness through experience and track record. Additionally, black women are held back to work on one or two areas of development, while white males advance with the understanding that at some point they should address their performance deficiencies. The key word in the previous paragraph is “sponsored”. Black women are more likely to take risks at work but are less likely to reap the rewards if successful or be disproportionately punished if they fail. When black women are successful it’s often downgraded or seen as on par with everyone else. There is a difference between a sponsor and a mentor. A mentor is someone who offers confidential insights. A sponsor makes sure those successes are amplified to the right people, speaks on your behalf and has the influence necessary to help you make the short list. About 11% of black women and 13% of white women report having sponsorship. This is woefully behind the amount of sponsorship white males receive. White males are also more likely to go after a position with only 60% of the required skill set while women wait to have almost 100%. This oft quoted statistic is the result of a Hewlett Packard internal report. Initially this was used to support the theory that women in general aren’t promoted because they lack confidence. However, on further review, women said they didn’t go after jobs with less than 100% because they didn’t think they would get hired without meeting the qualifications. A report from McKinsey & Company supports that notion. It found that men are hired or promoted based on their potential while women must demonstrate worthiness through experience and track record. Pump your breaks. Even when women, especially black women, demonstrate their worthiness they still aren’t considered as good. In September of 2012 the Journal of Experimental Social Psychology published an article called Failure is not an option for Black women: Effects of organizational performance on leaders with single versus dual-subordinate identities. The experiment using 228 participants found that black women were judged harsher for failures than their white male and female counterparts. The participants were given fictitious articles where the traits of only the leader were changed based on race and gender. However when the organization achieved success all groups were viewed the same as each other. Further, Valerie Purdie-Vaughns, a psychology professor at Columbia University, suggests based on her research that people’s minds are biased to ignore black women. When they hear black executive they think black male; when they hear female executive they think white woman. In short, there is little evidence to support the notion that black women aren’t as capable as their counterparts. In fact, it seems to be the opposite. The more competency they demonstrate the harder it is for them to get ahead unless, of course, they have a sponsor. Joan C. Williams, Clayman Institute for Gender Research at Stanford University, says that women need to prove themselves over and over again. When men succeed it’s because of skill, when women succeed it’s attributed to luck. And when women fail it’s remembered for a longer period of time. 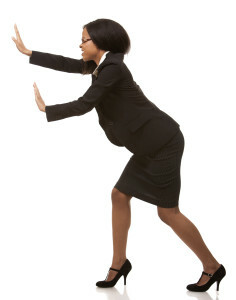 Do Black Women Have “Attitudes” Or Are They “Difficult To Work With”? In my 20+ years of experience if there was a toxic person or someone was difficult to work with it was a white woman. Though in one case it was a black woman and in another a white male. Luckily I didn’t encounter this too often. The caveat to that statement is I’ve worked with very few minorities period. I am typically the only one in my group and/or function. So to be candid, given those numbers the odds were extremely high that if there was a toxic person around they would be white. The problem is when you’re the only one you become the standard for the group you “represent”. An example from my early career (and I have many from this year too) that illustrates this double standard is when I worked in financial services. I worked on a trading floor/desk. I was supposed to have a certain level of grit to deal with the rigors of the job. A young white woman got extremely upset with me and suddenly started screaming at me. I professionally informed her if she wanted to speak to me we can go in an office otherwise she needed to leave me alone immediately. She walked off. I later learned this episode was caused by a minor misunderstanding. Who do you think was spoken to in this situation? Me. I was too “rough” with her and had an “attitude” when I told her to leave me alone and stop verbally assaulting me in front of the entire department. If I hadn’t been difficult to work with in the first place she would have been more comfortable approaching me. She, on the other hand, was not reprimanded in the slightest. The misunderstanding, you might be wondering, is earlier that day she asked me where the phone book was. It was around the corner from where we were standing. As she turned the corner I said “it’s that first cabinet, do you see it?” in a louder voice so she could hear me. Therefore, she said, I yelled at her first. She waited hours to come back to scream at me. I’m sure there were extenuating circumstances and that’s why she should have been spoken to, not me. Instead I was judged to be the aggressor because all black women have attitudes and are difficult, but she was judged as an individual who was just having a bad day. Madeleine is a strong performer, no real complaints about her, and has development goals, education and experience on par with or more than everyone else in her group. No personality conflicts with peers or leadership and is very well liked and respected. She begins to question why her list of development goals are longer and never seem to be met while her peers move up. As she continues to raise concerns she suddenly has performance issues and begins to experience retaliation. In order to justify the treatment of her the big three are invoked – attitude, difficult, aggressive. Then, that’s it. No one investigates to see if that’s true or even to see if it ever appeared in prior performance reviews. Career successfully derailed or delayed. It is so easy to blindly believe stereotypes of black women. Most of these are generated from biases people don’t realize they posses. Get Malcolm Galdwell’s book Blink, immediately. He talks about this topic so eloquently. It’s acceptable for a white male to not only ask for a raise or promotion, but to expect he’ll get it. While black women have to wait patiently to be told they are ready to advance. A black woman asking for a promotion or taking control of her career is judged more harshly than any other group. Take the case of Erica Baker, a former engineer at Google who claims the iconic company retaliated against her for an experiment to expose salary disparities. She was denied her peer bonus, not because of the salary issue but because she has performance issues. Her peers awarded her the bonuses in gratitude. She may very well have performance issues, but they weren’t enough to deny her a bonus before now – “the formula”. Leaning in only works if you are in the proximity of your destination. For many black women leaning in would only cause them to fall over. 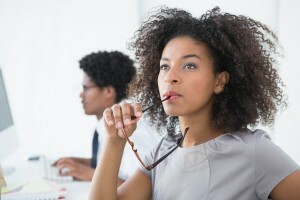 Should Black Women or Corporate America Lean In? Lean In is a great perspective written for others with the same perspective. Black and white women face the same challenges but to varying degrees. This phenomenon isn’t just in the workplace. Black women, in general, are seen as less than and this is perpetuated by the media. Leaning in only works if you are in the proximity of your destination. For many black women leaning in would only cause them to fall over. One must be near what they want to lean into and, in many cases, we aren’t even in the same building as the glass ceiling. Essentially, white women lean in, black women push through. Perhaps it’s time for Corporate America to do the leaning and here are six ways they can do so. 1. Corporate America (and all workplaces) must lean in, that includes white males. Corporate america will soon find themselves desperate for strong leadership and skilled talent, so then why disenfranchise a whole population of smart and talented human beings? Some of my best mentors and advocates were white males. By the way, they didn’t do it because I’m a black woman, they did it because I’m talented. Corporate America must lean in and hold managers truly accountable. If an employee is surprised they have performance issues that didn’t exist 6, 3, or even 2 months ago, the HR organization and the one-over manager should be held accountable to the sudden change. Good managers should be rewarded and bad managers should be developed, remain individual contributors or ousted. Part of the talent drain is poor managers regardless of color. HR already has a vested interest in holding managers accountable to the development and success of their people, that is to stop the whooshing sound. 2. Start assuming we are qualified for our a position or promotion. It wasn’t an act of “professional white male genocide” (affirmative action). Rather than thinking we are out to get white men start believing we are out to create successful and wonderful lives for ourselves that just 50+ years ago seemed out of reach. Just a side note, affirmative action, according to a Time article, has helped white women more than any other demographic. But along those lines for the love of all that is good in this world please stop acting surprised when we say we hold an advanced degree, attended a certain caliber of school, or that we were not the first in our families to attend college. Rather than thinking we are out to get white men start believing we are out to create successful and wonderful lives for ourselves that just 50+ years ago seemed out of reach. 3. People need to stop believing what they see and hear in the media about black women. This one is fairly straightforward. There seems to be a disinterest in understanding black women. It’s almost as if we’re aliens visiting the earth and the only way to learn about us is to watch crap television like it’s National Geographic for black women. That is all. 4. Celebrate the value we bring to the team. America is struggling to find top talent, especially in key areas of technology, engineering and math. Why, just why, would you exclude an entire group of people to make it more difficult? According to a USA Today article, in 2013 4.5% and 6.5% of bachelor degrees in computer science or computer engineering from prestigious universities went to blacks and Hispanics respectively, yet they only hold they only 2% and 3% of the current technology roles. They can’t get hired. You may be familiar with experiments that send the exact same resume to an employer and the person with the black-sounding name doesn’t get called but the white-sounding name does. One of the best teams I was ever on were a bunch of total strangers. We were picked based on our backgrounds to work on a project by someone who didn’t know any of us. We were from different parts of the world, different educations, spoke different languages and our skill sets complimented each other like a glove. That team came together quickly and effectively. 5. Become aware of personal and cultural biases that may be holding others back and eliminate them. The bad news is bias may just be a habit. We may not even know when we’re being influenced by a bias. The good news is a habit can’t continue under the spotlight of awareness. Once you become aware of the bias the brain stops and is open to going down a different pathway. Think about how you evaluate the performance of everyone on your team. Do you show favoritism to someone? If so, why? If you feel it’s because they are a top performer, then great. But if you have a diverse team and you haven’t labeled the person/people of color high potential, ask yourself why and if they really are all that different from the rest of the team. 6. Provide clear, specific and actionable feedback. This goes to why black women may not be categorized as high potential. Black women in the workplace find it extremely hard to get feedback they can do something with. This makes it easy for others to apply “the formula”. Delivering tough feedback to anyone is difficult. Black women are every bit as ambitious as white men. If they are trying to get from point A to point B they need the information. They need to know what to keep doing with examples, what to stop doing with examples, and a fair assessment of their abilities and gaps along with a development plan that both the manager and employee work on together. The reason “the formula” hurts so much is because a manager has all of the opportunity in the world to give the feedback and they don’t. And it comes across as intentional derailment. They waste everyone’s time or worse they talk about the person behind their back to other leaders in the organization. This is either cowardice or laziness. Leading and managing people is not for the faint of heart and it’s not a right. If you can’t do it, don’t be a manager. If you don’t want to do it correctly, don’t be a manager. In a world where companies are struggling to fill leadership roles from their bench strength they need to be attracting and retaining top talent of all races and genders. Black women are as ambitious, educated, skilled and professional as their white counterparts yet struggle to move ahead. If Corporate America doesn’t lean in and soon, black women will continue to take their paid training and expertise to start their own million-dollar businesses. They may also become the competition and start taking talent from these companies. While most of this article pertained to Corporate America this happens in education, the sciences, etc. What are your thoughts? Did you like this article? Be sure to share with your friends and colleagues.